All through the Festival the "Peñas" seem to be the epitime of pure anarchy, but even pure chaos needs some basic organization. These clubs have been gradually founded throughout the history of the Sanfermin Festival for the purpose of providing a basic structure for its members during these wild days of the fiesta. Once founded, they have gradually extended their activities to include other events throughout the year, mainly gastronomic and sport ones, but without ever forgetting that their basic and most important reason for existing is, to celebrate the San Fermin Fiesta together. The role of the peña during sanfermin? They have a key part to play on the terraces of the bullring during the bull-fights where their presence is fundamental. Here, the different clubs, each with their distinctive dress, and seated under their distinctive banners, are gathered together in a loud raucous crowd which totally dominates the atmosphere during the afternoon bull-fights. They also mark the difference in the street with the continuous din of their brass-bands reverberating round the streets of Pamplona day and night. Even though there are other, more professional bands which are paid by the Town Hall to play music in the streets, there is nothing to compare with the colour and joy that the “Peñas” create. The Fiesta would not be the same without the musical parades of the Peñas as they lead the crowds singing and dancing through the streets into all hours of the night. And in fact, this difference, in the absence of the “Peñas”, can be noted. On the night of the sixth, the opening day of the Festival, they don’t parade in the street. Where are the Peña clubs on Pamplona? What part of the bullring do the Peña clubs occupy? Most of the “Peñas” have their premises in different locations along the length of Jarauta Street, which is in the heart of the old quarter of Pamplona. This street has always been fundamental in the celebrating of the Fiesta. And indeed one of their basic “services” towards the well-being of the Fiesta is precisely here, where they open their premises to the general public for the duration of the festival. Each one has its own bar where you can eat (in some of them) and drink, sing and dance, any hour of the day or night, all through the eight days of the Fiesta. If they close for an hour or so, it will only be to stock up supplies to ensure the party continues. Strangely enough, the different clubs only make up a membership of about five thousand people in total. So, in that sense, you can´t say they are truly representative of the total population of the city. On the other hand they are the ones who set the tone for the Festival and in fact they take part in meetings and committees with the Town Hall during the year to decide on what particular events will take place each year. They also get some financial help from the Town Hall to help in the preparations for the annual event. The spirits of the crowd now reach a climax at the finish of the bullfights. The loud raucous crowd form disorderly behind the different brass bands of the “Peñas” in the middle of the arena and prepare to be led out by the music, singing and dancing behind whichever band they have chosen to follow. It´s certainly a sight to see, as the ragged, wine-stained but happy horde head out into the streets dancing behind the slow-marching brass bands. The high-spirited crowd has been well nourished by all their eating and drinking during the bullfights and their excitement is contagious when they hit the streets. However, if you haven´t been through the same experience in the stadium as they have, you may feel a bit “cold” about joining them as they move slowly through the streets outside the ring. They have been well-oiled by all that has gone on during the fights, the noise, the pushing, the sweating, the drinking, the flour-fights; the whole experience has set the tone for their exuberance and if you have not been part of it, it may be difficult to enter into the spirit of the thing. The “Peñas” march in a disorded file towards the nearly Main Square of the town. Here, they spread out in different directions, each one heading towards their own club, but on a meandering route that could take several hours to cover what is in fact a very short distance It all depends on how much they want to “party” in the street. The sight is worthing seeing as the wild, ragged and drunken crowd create a din and exuberance and expend an incredible amount of energy dancing and singing for several hours. Many people have been soberly waiting along the streets for the “Peñas” to make their exit from the ring and many people, even mothers with their young children join in behind the marching bands despite the fact that they have shared the same “spirits” as the “Peñas” inside the ring. In the Pamplona bullring the division between the sunny side and the shaded side does not make that much sense. A more pertinent division is that between the area of the Peñas and the rest of the public. And it must be said that the atmosphere among the Peñas is quite singular and unique. Anyone who has not seen a bullfight from the area of the Peñas cannot say that they have lived the Sanfermines totally. If someone wants to be in the area of the Peñas, then that area is to be found above the bullpens and belongs to part of the section 5 of the front rows area, all of section 6 and a part of 7. The Peñas are also in part of the andanada grandstand, concretely in sections 11, 12 and 13. They also have sections 5 and 7 of the grada or stand area. These divisions are not necessarily strictly observed by the Peñas but they do exist. 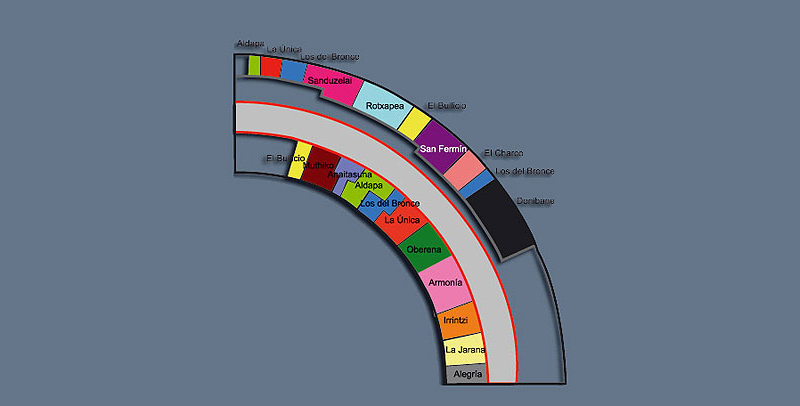 Even among the Peñas there are a series of red lines to indicate the different parts. This of course is easy to see when the bullring is empty but in Sanfermin, the friendly ambience will also help us find the seats without much problem. In any case, there are many anecdotes and stories about good times which started for people who got their seating wrong and still had a great time. There are sixteen “Peñas” (Social Clubs which admit a limited number of members) in Pamplona. They each have their own clubhouse and exist throughout the year, mainly for the purpose of celebrating meals together. They make up a federation and publish a magazine. 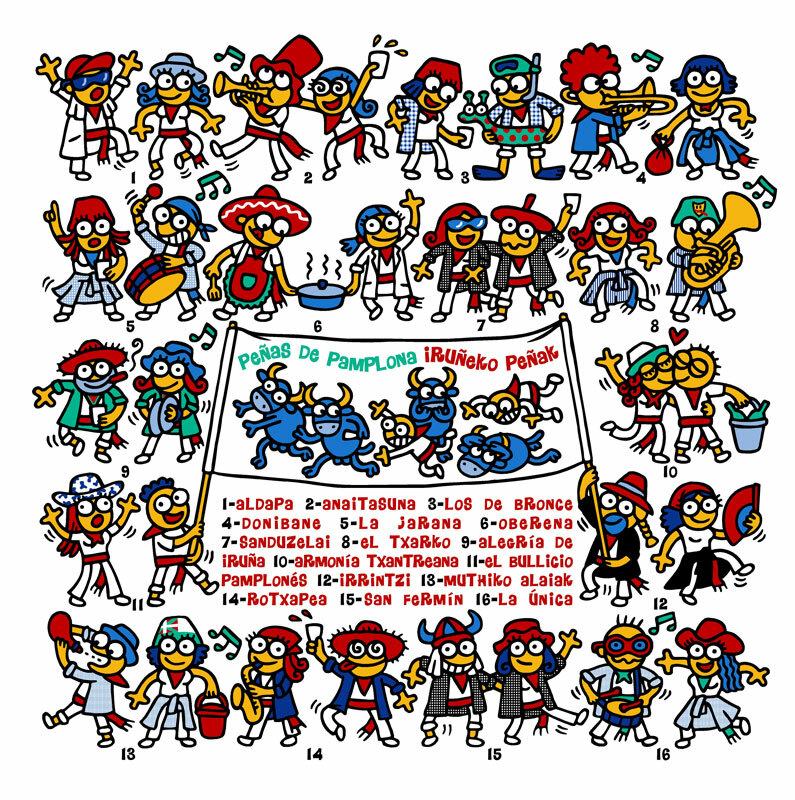 They also have an internet site about the peñas, where you can find a lot of information about what do they do not only during the Sanfermin festival, but also the rest of the year. The oldest one dates from 1903 – “La Unica” and since, the others were gradually formed thoroughout the following decades. Originally, they were men-only clubs, but now both sexes are members in almost all of them. (Hooray for progress!). Sanfermin is no longer “the last bastion of the macho” as Hemingway once described it. And neither are the “Peñas”. Their premises have also gradually improved in decour and comfort which just goes to show that civilization is progressing, I suppose. Located at no.50, Jarauta Street and also at 17, Manuel de Falla, ground floor. Telf. +34 948 239 448. The background to this Peña must be divided into two parts. Firstly, its origins in the 1930’a and its presence in the newly-expanding section of Pamplona at that time. Then came a second phase, when the Peña club was re-formed in the Milagrosa suburb during the Sanfermin “txiquito” of 1978. Originally the premises was in Estella Street and the members were from around this area. when the club moved to Guelbenzu Street the membership saw a sharp rise in numbers and the club became much more active. Some years ago they moved to their present premises in Manuel de Falla. A book has been published which recounts the history of this Peña club. It was edited by Josu Noáin under the title “S.D.R. 7 de Julio San Fermin, historias en torno a la Peña”. The book contains 260 pages and includes about a thousand photos, posters, pamphlets and stickers over its whole period in existence. This Peña club is characterized by certain differences from most of the other Peñas. From the beginning there were ten women elected to its governing board. They dress in a smock of black and white checks. The Peña San Fermin also have numerous activities throughout the year. There is a group of Zampanzar dancers, an entourage of carnival giant heads. They also organize an annual trip to Jerez every month of March to look at some of the bull-breeding ranches which send bulls to the Sanfermin fiestas. Initially, back in 1900, there was an attempt to form a Los del Bronce Peña by metal workers in Pamplona. It was necessary to wait until 1950 for this idea to materialize. Various groups of workers came together to create the Peña Club. A checked blue and white smock was chosen as their color which, according to some anecdotes, was a cheap cloth to buy. At the time it was something of a novelty to wear this gear all day, as it was more habitual for the Peña clubs to only wear the smocks to the bullfights. As this smock covered the traditional sash, it was decided to leave of using it. The football team from this Peña originally used the smocks as their football shirt as they lacked funds to buy proper shirts. In the 1960’s the “los del Bronce” Sports Society was created within this Peña and a premises was rented at the “Telefonicas” Bar. There are many anecdotes from this period, among them, that a consume soup was sold at 10 pesetas and, if you wanted a clean mug, it cost 20 pesetas! It seems that the kitchen was in an open patio with no running water. Another story is that the winter of 1967 was so cold that they had to make a clandestine connection with the heating system of the nearby San Lorenzo church. Besides their San Fermin activities, this Peña organized sections for a football team, handball team and music classes. From this latter section, started by Fermin Lacunza, the “fanfare Jarauta 69” band came into being and they took their name from the premises of the Peña club. Since 1979 the Los del Bronce Peña Club have been in their present premises at no. 54 Jarauta Street. There a rugby team was created in 1988 along with a cultural section to do with Sanfermin. This “stepping-stone” to the fiestas is celebrated on the following Friday to the traditional “stepping-stone” dates, and they celebrate round-tables, meetings and music sessions. They also organize cookery classes and during San Fermin they provide a fixed menu each day at their premises. Thanks to José María Sáez we knew that the Peña El Bullicio Pamplonés was founded in 1933 by a group of friends for the express purpose of celebrating the Sanfermin fiestas. In addition, they organized excursions to the mountains as well as football games and card games of mus. In 1943 they moved to a bigger premises at 28 El Carmen Street due to the heavy demand for membership. There dances, known as the “El Bullicio” dances, were held regularly in order to cover expenses during the Sanfermin fiestas. In 1953 the club was unable to cover the costs of the premises and they left. They used the bar Cordovilla as a meeting place for a period. In 1975 the Peña Txiki was created for children and with a new demand for membership it was decided to rent the premises of what had been the Simons Café bar at 22 Del Carmen Street and this became the definitive location of the Peña club. The members dress in white, without a smock, with the badge sewn on the club necktie. In 1977, several young men from the San Juan neighborhood took the initiative of founding this Peña club with the same name as their area. They started up right in the fiestas on the 7th of July. Not until 1985 did the club change its name to Donibane. Their premises dates from 1979 in the Virgen de Codés Street. They dress in classic Sanfermin gear and with a light blue smock and a necktie with the club badge. This is the largest Peña in Pamplona. The big number of members meant that the club had to buy a bigger premises in the Avenida de Barañain and this remains their present location. This new premises had formerly been a bar -restaurant EL Burger and the El Kilikis restaurant. They also bought up the Bar 35 in Jarauta Street and this is their headquarters during the fiestas where the use the name Galtzerdi. This club has a lot of different activities going besides the Sanfermin fiestas. There are cookery courses as well as Basque language classes and many competitions of varies sports and card games. It is a popular gastronomic club with a dynamic membership. Among their anecdotes was the famous theft of their banner one year on the 7th of July. It was necessary to take recourse to the children’s banner that year. Some months later the banner reappeared in the town. Membership day is celebrated during the Sanfermin fiestas. Aldapa was founded in 1947 as a sports club. In 1958 it was constituted as a Peña and in 2008 it celebrated its 50th anniversary. While this Peña does not wear a smock members are easily recognized by the club badge which is sewn onto their neckties. Their premises are sited at no. 48 Jarauta Street. There are 275 members currently enrolled in the club. They celebrate a traditional New Year’s Eve event with a live band in their premises each year. They name of the club comes from the name of a bar where they first used to meet up in the early days. In the 1980’s they acquired their present location. Here they celebrate regular dinners and they also have a football team in the Boscos Cup competition. They have their own Sanfermin song and the chorus goes something like: Here they are, here they are, the boys from Aldapa, dancing the typical tipi-tapa,/ this is their fun. / there they are, there they are, taking part in the running of the bulls, they are as tough as nails…/Wow, what fun! The peña Alegría club was founded in 1952 in the Moto Club bar where two emerging groups were merged. Their first Sanfermin fiestas were in 1953, where they already appeared with a banner. Their origins came from earlier where a group of young men founded the Peña Imoztarra, named after the city bus that served the old part of town. They had a premises in Nueva Street. They used to meet to play football and to go out together as a group on the town. Meanwhile there was another football team called Alegría which used to meet in the Arrizabalaga bar in Agustín Street. These two clubs eventually merged in to the present Alegría de Peña club. Their earliest initiatives were connected with sports. They founded a basketball club and also went on mountaineering excursions. The club also created a gastronomic area from the earliest days. In 1969 they took up their present name. They dress in a green smock which has the neck, cuffs and pocket in red. They have a red necktie, with their badge sown on and the edges are in a green color. Up to the 1960’s their premises were located at the Or Kopon Bar and then they moved to Calderería Street where they re-named their premises as Bar Alegría. In 1973 they moved to no.8 Jarauta Street. On the 19th of July, 1978, after the violent events of that year during Sanfermin, their premises was destroyed by a bomb without suffering any human injuries. They then moved to their present location at no. 61 of the same street. In 2002 they celebrated the 50th anniversary of their foundation with various events. Another aspect of this Peña is their charity work, which has been working since 1960. They have a “Potato Operation” in function which consists of collecting potatoes and donating them to a nun’s congregation – “Las Hermanitas de Los Pobres” – which helps the poor. The club like to say that their full title is “A sporting, cultural and leisure club.” Apart from their Sanfermin activities, they also hold cookery courses and also Basque dancing classes. They also celebrate the “day of the beer” and a Mexican fiesta as well as a mus card-playing championship. 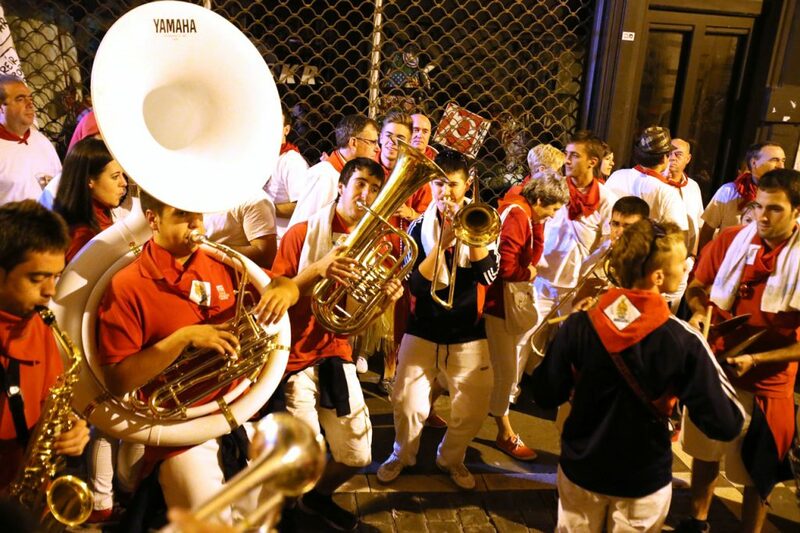 This year makes the fifteenth consecutive one that the brass band – “La Charanga Incansables” accompany the Peña club in Sanfermin. 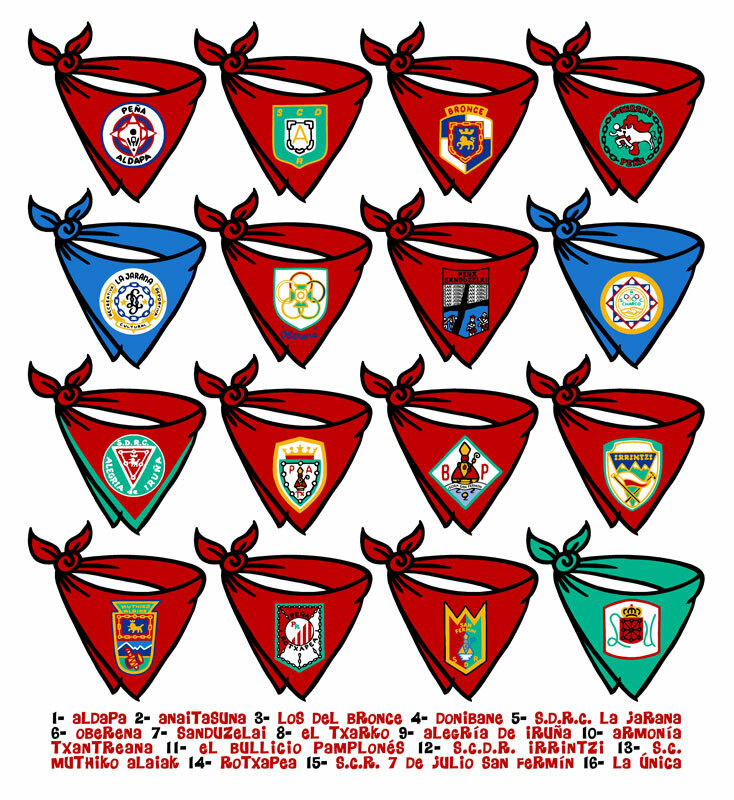 Anaitasuna is known by its characteristic way of wearing their badge on the pocket of their shirts and with a San Fermin on their red neckties. In 2009 they will celebrate their 60th anniversary. In 1948, in “La Perrera” bar, motivated by the members of the Anaitasuna football club, it was decided to form this Peña club with the aim of celebrating the Sanfermin fiestas together with friends and acquaintances. It was necessary to wait until June 1949 before they were given the permission by the other Peña clubs to officially become a Peña club. There were some 40 founder members and they kept their independence from the first in relation to the sports club of the same name. They commissioned their own tune from the Maestro Turrillas and their first banner was painted by Luis Cía. Among its many eminent members the American, Matt Carney stands out. He first came to Pamplona in 1950, invited by María Pilar Lassa. Here, he first discovered the Sanfermin fiestas through the Anaitasuna Peña club and wrote about it in the international press. In the 1960’s Matt Carney was awarded an honorary Sanfermin necktie for his work. In 1971, The Anaitasuna Peña received the silver award mention for Tourist Merits from the Minister of Tourism and Information. The club also has its own award called the Golden Banner. In 2008, it went to one of its own members, actor Pedro Osinaga. This Peña club dresses in white and has its badge sewn on its necktie. The Peña clearly had an influence in extending the widespread use of white trousers and white shirt in the Sanfermin fiestas. Even though some other Peñas were dressing in white, this Peña club extended its popularity by having all its members dress in white during various Sanfermines. The club was founded in 1956 and it was the first club to come from one of the suburbs of Pamplona. This fact also helped other Peñas form from other outlaying areas of Pamplona. At first, the club was called “Alegría Chantreana” and later, after changing its name, it decided to join up with Union Deportiva Chantrea. In 1981 the Peña decided to split from the sports club and it acquired premises in the Felix Bar, which had seen the foundation and growth of this club. In 2006 the Peña club celebrated its 50th anniversary and published a book “Armonía, 50 years”. Armonía Txantreana celebrates many events outside of the Sanfermin fiestas. From 1961 to 1993 it had a strong mountaineering section which eventually split to form its own mountaineering club – Txantrea Mendi Taldea. This club also has a competition for ecological wines. It also has its own Giants and their entourage and participates in its own neighborhood fiestas and it also has a football team for the Boscos trophy. The “Irrintzi de Iruña” Peña Club was founded in 1950 and its origins began with two football teams, the “Irrintzi” and the “Iruña” and that is how they the club got its name. From the very beginning their color was black, in homage to the typical dress of the people in the mountains. In 1953, Iruña separated as a football club and irrintzi became a Sanfermin Peña Club. They moved to premises in San Agustin Street where they have a first floor and two flats above it. These held the different sections of the Peña Club. In April, 1964 they Peña needed a larger premises and moved to 23 Estafeta Street. Due to problems with an upstairs neighbor, they moved to Carmen Street. There they acquired premises which became their headquarters. This premises includes a bar which they rent out to finance the Peña Club. This opened in 1971 and the club soon became a cultural and social club as well as keeping its sports section. In 1976 they celebrated their silver anniversary and they announced the first ever club amnesty. This consisted in admitting all former members once again who had been expelled for different reasons over the previous 25 years. In the 90’s the clubhouse was reformed and the number of members was enlarged. Besides the football, mountaineering has been one of the main activities of the club. They form a calendar of excursion days to the mountains along with the “EL Bullicio Pamplonés”. Both male and female members from the Irrintzi have been leading figures in instigating events in Sanfermin such as The Struendo ever since 1965. From this Pena the idea came to start the event at 11:59 in line with the trains that come in at that hour to Pamplona railway station. Tradition has it that they too were the ones to make the homily to the saint just before the start of the run an “official” act, with the placement of the neckties of all the Peña clubs. Before this the runners used to sing to an image of the saint which was a nun used to place on a window of the old Military hospital and which is now the Ministry of Education. The members wear a black smock. 16, Joaquin Jarauta Street is the site of the club’s premises. Telf. +34 948 225 218. The Jarana was founded in 1940 by some groups of young men from the Calle Carmen Street. There are some documents that ascertain that in 1931 a banner bore the legend: La Jarana salutes Turón” but the club itself maintains the club was formally founded in 1940. They decided on the color blue for their sash and necktie and blue checks for the smock. This was in imitation of the insignia of Pamplona which bore these colors. They began in San Fermin Street and then in Estafeta Street and in 1982 they moved to their present premises at no.16 Jarauta. The crypt used by this Peña club for dinners, etc. dates from the XIV century and has been declared of Cultural Interest by the authorities. There are three football teams in the club as well as an indoor team. 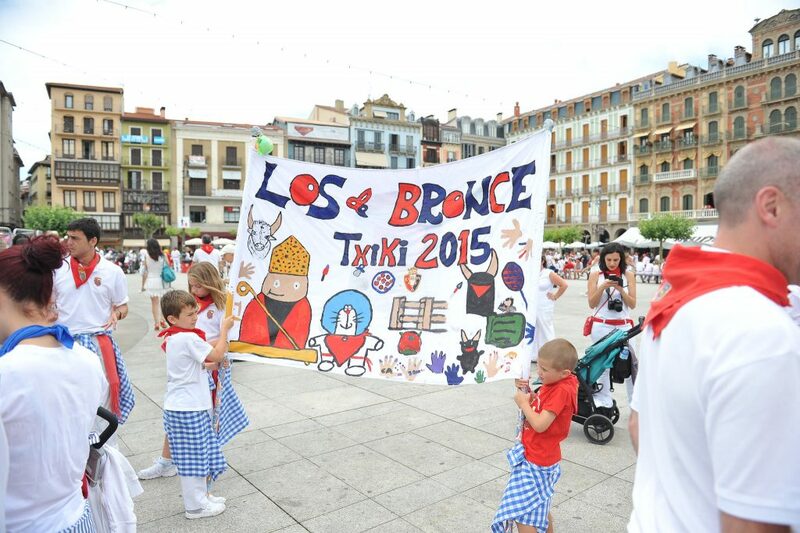 The children’s section is one of the biggest and the “Peña Txiki has 150 members and the kids celebrate their own special day during Sanfermines. This Peña Club originated from the Zaldiko Maldiko dance and theater group which was formed in 1931. In 1934 the Peña Club was created and it became a cultural society with the aim of widening its activities including their participation in The Sanfermin fiestas. The group of dancers continued to work and recover traditional dances such as the Ingurutxo from Leiza and they spread the knowledge of many other dances, before they finally disbanded. It was Baleztena who came out with a version of the “kalejira del Ingurutxo” with the lyrics “uno de enero, dos de febrero…” one of the classic Sanfermin songs. In the 1940’s Muthiko Alaiak were very active and they danced at the inauguration of Barajas, the Madrid airport. They also organized the first young bull event of the Peñas. In 1945, after some incidents in the main square of Plaza del Castillo, the Civil Governor closed their premises. They began to use some bars as meeting places, first at the Fructuosa and later at the García bar. Sometime later, they managed to acquire premises at 98 Calle Mayor Street. In 1954, once more after some street disorders, the Governor closed down the Muthiko Alaiak premises. In the sixties they moved between San Franciso street and the Plaza del Castillo square. Muthiko organizes Basque Language classes and excursions around Navarra. There are sections for mountaineering, football, handball and ladies basketball teams as well as the brass band and they also helped recover the choirs of “Santa Ägueda”. Some well-known Basque handball players have played for the club, gaining national titles and championships. Especially in the Remonte speciality with Rodriguez, Lekumberri and Mina. They organize the “Rey de La Faba” annual event. In 1974 they moved to a premises in Comedias Street, where they stayed for 25 years. Some years ago they moved to their present premises in Estafeta with a ground floor and first floor flat that looks out on the running of the bulls route. They dress in a blue small-checked smock. The Club Deportivo Oberena started up in 1940 with the aim of creating healthy activities through sport and also with an eye on folklore. Santos Beguiristáin, a priest was the man behind the idea and his first members came from the youth of the city parishes of San Saturnino, San Nicholas, San Agustin, San Lorenzo and San Francisco Javier. The green insignia came from the Catholic Action organization, and the rest of the uniform is white and black. On the 20th of January, 1941, the San Fermin Peña was founded alongside that of the football, mountaineering, handball, cycling and swimming. There first public appearance was made on the 7th of July, 1941 during the fiestas. The following year the dance groups, and traditional whistle (txistu) and choir groups were formed . They used the Labrit handball facilities as there headquarters until 1983. The Oberena Peña has close ties with the world of bullfighting. For example, the bullfighter, Antonio Ordoñez, kept up a close relation with the members of this Peña, and he was named as an honorary member. Ordoñiz, in his time, had a close friendship with the president of that period, Fernando Salcedo Cilveti and he passed on his affinity for the club to his grandchildren. For that reason, members of this Peña club have helped out bullfighters like Francisco Rivera Ordoñez when they wished to participate in the running of the bulls. In 1990, when the club celebrated its fiftieth anniversary, some bullfighting workshops were held with breeders such as Jaime Pablo Romero and Victorino Martín (the father). For the San Fermin Fiestas, the Oberena Peña have a social premises at 31, San Lorenzo Street, in what used to be the old Lantzale restaurant. In addition, during Sanfermin fiestas over these last few years is the annual performance of Patxi Larumbe with the piece from Antonio Molino, “Soy minero”. This usually takes place at about two o’clock in the morning and after the performance he is thrown up in the air by his fellow members. This peña club started up with the idea of creating a vicinity club for the young people of the area who were spread about among different Peñas around Pamplona as they did not have any Peña in their own area. The Sports club, Unión Cultural y Deportivo Rotxapea, created a section for this new Peña on the 24th of March, 1979, with Bernardo Apesteguía as the first president. Their present premises is the same ever since 1982, while earlier they had used the Gure Txokoa in the Ave Maria. There are about 200 members. They use a premises at 73 Decalzos during the days of the San Fermin fiestas. The relationship between Peña Rotxapea and Sanfermin is prolific. In addition, it is active in sports areas, helping out the Club de Waterpolo Navarra when it was needed. Last year, in 2008, they organized round tables on Sanfermin and the bulls, during six consecutive Tuesdays between May and June. This Peña Club started up in 1979 and had its first Sanfermin fiestas in 1980 as Peña San Jorge, with a smock in black and white checks. In 1996 they changed their name at an assembly of members and with a popular vote in favor they changed their name to Peña Sanduzelai. The San Jorge Neighborhood Association allowed them use a premises when they had no center of their own. Later they found premises in Doctor Landa Street. With an increase in membership it was necessary to carry out rehabilitation work on the premises and they continue to use this same address. During Sanfermin, they have the use of a premises in Jarauta Street. This is a very dynamic Peña club and they organize many activities and events in their neighborhood. Furthermore, they are a key element in organizing their neighborhood fiestas as well as with the Olentzero at Xmas and also with the Santa Águeda choirs. They also have their own annual celebration on the day of the Peña with various competitions including a paella contest. It is reported that the club started up thanks to a splendid drinking session on the 24th of December, 1974 in the bar Marín. Along with the hangovers the idea of a Peña came up. They are known as “El Charco” (pool) thanks to the fact that when it rained a large pool of water formed in front of the bar Marín. This is the only Peña which does not strictly belong to Pamplona, as this municipality has its own Town Hall, although it seems just like any other Pamplona suburb. On the 28th of November, 1975 the first statutes were passed and a premises was rented at no. 8 Mendikale Street in Ansoain. While there were only ten founder members, within a year there were more than eighty members. Before they first appeared as a public Peña, the club created a dance group and majorettes as well as starting a theater group. On the 7th of July, 1977 they appeared for the first time in the Sanfermin fiestas. They also participated that year in the Xmas festivities of the Kings and their entourage in Ansoáin. Later, a football team and a school of “jota” singing were formed. They also organize a popular El Charco athletics race held at the beginning of May each year. They dress in white with a blue sash and necktie and they have a smock in blue and white stripes. During Sanfermin fiestas they use a premises at No.75 Jarauta Street to be close to the action during fiestas. The first documented evidence of the existence of this Peña date from 1913, although there are those who believe it was founded in 1903. The Peña was originally founded by a group of youths from Guipuzca. They paraded with a banner which read “Los de siempre” (The permanent ones). Consequently, La Única is the oldest Peña in Pamplona. In fact, the name suggests that they were the only group that paraded during the fiestas to liven up the fiestas. At the time this was not a customary habit in Sanfermin or outside the fiestas, but the people liked the idea, although the authorities took a dim view of it. They used brass band instruments, which we now call “txarangas” bands. At that time it was usual to go around with guitars and lute-type instruments which made less noise and these groups were against the idea of brass instruments. This Peña dress in green sashes and neckties and wear the old-fashioned “alpargatas” footwear. It is thought that the green comes from the original flag of Pamplona. They also have a smock of small blue and white checks. Little by little other Peñas were formed and the ambience took on the color that today still remains. During the 1940’s they organized weekly dances in their premises to get money for the club, which was popular in the city at that time. Later the Jarana Peña club would do the same. In the 1970’s this Peña opened its doors to new members and it was the first Peña to have a woman president, who also became the spokesperson for the federation of Peñas. El 21 de Agosto de 1992, a una cuadrilla de amigos, a instancia del “ideicas de bombero” de Joaquín Baleztena Gurrea, no se les ocurrió mejor idea que fundar una peña nueva mientras se tomaban un porrón de clarete en el bar Vinos el Cosechero, alias “El Marrano”. Y así, trago va, trago viene, nació la Peña Mutilzarra. La Peña sobrevive, como una asociación sin ánimo de lucro, apolítica, festiva (y muy festiva) y cultural. Tras unos comienzos sin encontrar una ubicación fija, en el año 1995 se traslada a la calle San Agustín 40, realizando actividades mas continuas fuera de los sanfermines. En el año 2005 se inaugura la actual sede social en C/Olite 15, manteniendo el local de C/San Agustin durante las fiestas de San Fermin. Actualmente su local se encuentra en la Calle Ciudadela nº 3 en lo que era el bar Ciudadela. Inauguraron en 2010. Desde la suspensión del Riau-Riau, se trata todos los años de recuperar esta tradición tan nuestra y junto con las Asociocaciones de Jubilados de Pamplona se viene participando y apoyando el Riau-Riau no oficial hasta su incorporación de nuevo al programa oficial. Vestimenta: blusón de color rojo y pañuelo rojo bordado con el escudo de la Peña. Tienen un himno titulado “Aupa Peña Mutilzarra”, compuesto por Ramón García. En la plaza de toros (cuando consiguen entradas ya que no reciben abonos) se sientan en la Andanada 14.